I'll be the first to admit that traveling alone for the first time can be scary (in fact, I wrote a blog about it). What happens if you get lost? What if you look like a fool? What if you can't communicate with anyone? Will people think you're a loser if you eat alone? And what do you do if you get lonely? The reality is this: if you get lost, you will find yourself, and if you look like a fool, there's no one around to make fun of you so who cares? You can easily learn a few words in the language of the country you are in, and most people are kind and will try to understand what you need. Eating alone isn't that bad, but if it really freaks you out, I have some alternatives below. And trust me, you will learn that when traveling solo you will be anything but lonely. Try to arrive in a new country, town, or city when the sun is still up and local businesses are still open. It's safer, but will also ensure that you can easily find a place to stay, get something to eat, and get directions if you need them. You are the one who will be carrying everything that you bring with you, there will be no one around to help you out. If you are a budget traveler like me, this may require schlepping your gear for long distances. Trust me, you will be cursing those extra three pairs of shoes you threw in "just in case" after the first 10 minutes. Concerned about eating alone? Don't be. It's awesome. But, if you are really worried about it, try eating your big meal at lunch instead of dinner. It's common for people to dine alone in the noon hour, plus many restaurants offer smaller portions of their dinner dishes at a much more affordable price during the day. That means your travel budget will stretch longer! The best part of traveling solo is that you are on your own schedule! That means you eat when you want to. So, eat like the locals do and grab a meal from a street cart (watch for the busiest carts, those will have the freshest and most delicious options). This is the perfect way to sample some local flavour and a great excuse to sit on a bench and people watch while you dine! Go where you want, when you want! Did you meet someone that told you about this awesome festival happening in the next town that you had no idea about? If you have nothing booked then you don't have to worry about cancelling reservations! In my experience, traveling solo means meeting more people than when you travel with friends. When you are alone you appear more approachable, and you are probably more willing to reach out to new people. Stay in hostels, B&Bs, or guesthouses with common rooms if you are looking to meet people easily. There are also free or affordable walking tours that you can take in most cities that will help you meet both fellow travelers and some locals in-the-know! Now, let me clarify. I am not telling you to put yourself in danger or do something that will risk your (or someone else's) health. I'm talking about things that you would NEVER do at home. Eat alone, hike up an active volcano, go to a full moon party, do non-stop yoga for a week — there is no one around to judge you, do something new! Walk like you know where you're going (even if you don't), look at your map confidentially, and don't let people approach you on the street (they might be distracting you to pull a scam). Making sure that you have neutral clothing (leave the patriotic t-shirts at home) that will help you blend in with the locals is also a good idea. Don't bring flashy jewellery or expensive technology with you unless you absolutely have to. It will only make you a target. Ask the guy at the front desk of your hostel, guesthouse, or hotel where the best places to eat are, the areas of town that should be avoided, and about local hot-spots. Other locals to ask for advice would be your waiter, barista, and the people working at the information desks at art galleries or museums. Now, there's no need to become fluent, or even be able to hold an in-depth conversation in a foreign language. But learning a few key words and phrases in the local lingo will endear you to the locals, and will help you greet someone, find the bathroom, and order a beer with ease! On a recent trip to Sweden, I found myself in the city of Gothenburg with no map, no access to wifi, and no data plan that allowed me to use my phone to figure out where I was. I had the Lonely Planet Sweden in my bag, but the only map large enough to be of any use was of Stockholm. It was unbelievably frustrating to think that in this age of technology, I could still find myself completely lost with nothing to help me navigate the city I was in. Normally, I would have planned ahead, making sure that I knew where I could get a paper map, or taking screen shots of Google Maps when I had access to wifi. Circumstances beyond my control had thrown me into the helpless situation however, and, as someone who is rarely unprepared when exploring a new city (yes, I am Type A), it really didn't feel great. Eventually, I found a coffee shop with free wifi and figured out where I was and how to get to where I wanted to go, but I figured that there had to be an easier way. And that's when I found Maps.me. This fantastic app gives you access to fast, detailed maps that you can zoom in on and search while you are COMPLETELY OFFLINE. All you have to do is download the map of the city you are visiting when you are on wifi (or data) and then you have access to it when your phone (or tablet) is offline and with you while you are exploring a foreign city. You can figure out exactly where you are thanks to GPS, get route information, and bookmark favourite spots so that you can return to them later (or remember them to tell friends about in the future). While I will always love the feeling of security that comes with having a physical map in my pocket (what happens if my phone battery dies?! ), this is a fantastic way to be able to navigate a new place without getting stuck paying ridiculous data fees or feeling like you are a slave to wifi. Do you only have a day to spend in Shanghai? You've come to the right place! This is your 24-hour guide to the things you need to see and do in Shanghai! 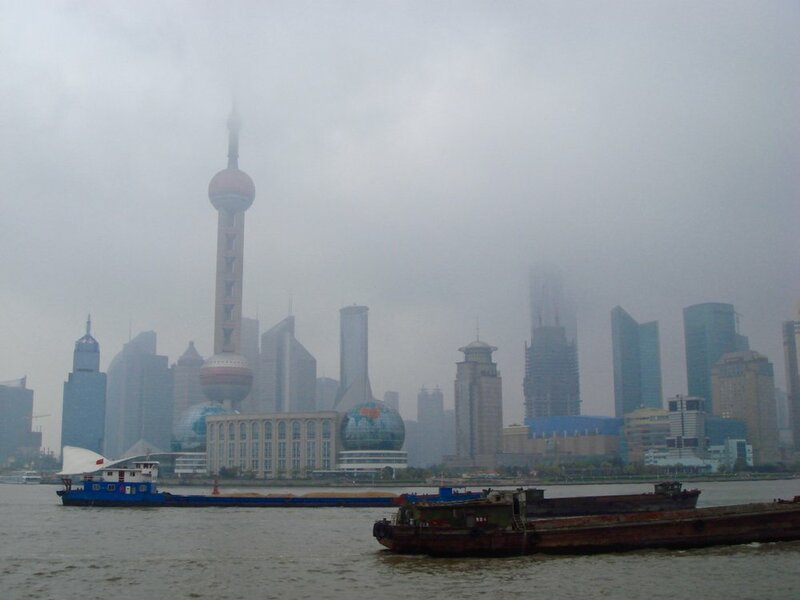 Sometimes referred to as the "Paris of the East," Shanghai is one of China's largest and most cosmopolitan cities. While it doesn't have the epic historic sites that you will find in Beijing and Xian, the city has a lot of great spots to explore! Start your day early with a walk along The Bund, a mile-long stretch along the river that used to be where those arriving by water would enter the city. It runs parallel to Nanjing Road, which is lined with historic buildings in a variety of styles that look like they were plucked from the streets of New York or a major European city. The imposing structures house foreign consulates, banks, museums, and swanky bars. The best part about a visit to this stretch of river is the view that you have of Pudong (above) across the river — day or night (or half immersed in fog), it's an incredible view. Grab some traditional, handmade dumplings for lunch in Old Town, and then spend some time wandering through the alleyways and gardens of the Yuyuan Gardens & Bazaar. The gardens were founded by the Pan family during the Ming dynasty and they took 18 years (1559-77) to create! They are stunning, with pavilions, carp-filled ponds, twisted pines, and a maze of arches to explore. Once the sun is starting to go down, East Nanjing Road is the place to be! This pedestrian-only stretch is where you will see neon signs galore (see photo at the beginning of this post) and there are lots of great options to dine — no matter your budget — and shop! On October 13, 2016, Thailand's beloved King Bhumibol Adulyadej passed away at the age of 88. The government immediately declared that the country would be in a year of mourning, with the first 30 days (until around November 13, 2016) being especially somber. Thai's are expected to wear black and refrain from participating in any celebrations or festivals during that time. What does Thailand's year of mourning mean for visitors? If you are planning to travel to Thailand in the next few months, be aware that some restaurants, bars, and clubs may be closed or have different hours. Trains, planes, and bus schedules may be disrupted, and there may be a more somber air on beaches that are normally teeming with loud, late-night party goers. Bangkok's Wat Phra Kaew and the Grand Palace will be closed to the public, as this is where the funeral rites are going to be taking place. "• Many Thai people will be wearing black or white clothing as a sign of mourning. This is not required of visitors but if possible, they should wear sombre and respectful clothing when in public. "Travel today is ticking things off: ‘Whew, I’ve done Machu Picchu, now I can get drunk.’ It used to take three weeks to get people in the right frame of mind, to un-brainwash them. Now it would take three months to get people’s heads straightened out… It’s a real problem now—people don’t know how to enjoy life. They want hedonism, short-term thrills." "Travel is never a matter of money, but of courage." "To understand what’s going on in the world, you have to see the world." "The answer to the world’s problems today is not to turn inward. We simply have to seize every opportunity to promote understanding between countries and across cultures. And there’s no better way to do that than to explore the world with an open mind, a sturdy carry-on, and clothes that don’t wrinkle." "I always wonder why birds stay in the same place when they can fly anywhere on earth. Then I ask myself the same question." "Not I, not anyone else, can travel that road for you. You must travel it for yourself." "At the end of the day, your feet should be dirty, your hair should be messy and your eyes sparkling." "Live, travel, adventure, bless and don’t be sorry." "You’ll never know until you go." "Loving life is easy when you are abroad. Where no one knows you and you hold your life in your hands." "Travelling is about finding those things that you never knew you were looking for." "I can’t think of anything that excites a greater sense of childlike wonder than to be in a country where you are ignorant of almost everything." "And if travel is like love, it is, in the end, mostly because it’s a heightened state of awareness, in which we are mindful, receptive, undimmed by familiarity and ready to be transformed. That is why the best trips, like the best love affairs, never really end." "I travel a lot: I hate having my life disrupted by routine." Make lots of noise when you are hiking. Bear bells are not going to cut it. You need to talk, laugh, clap, and sing, especially near areas where bears might wander like streams or by food supplies. Speaking of food, if you encounter a dead animal in the bush, do not go near it. If a bear isn't nearby, the smell of the carcass will draw them soon enough. Avoid areas that have bear droppings, tracks, turned over rocks, or torn up logs. Those are all signs that a bear is nearby. Dispose of any food or garbage in marked containers, do not bring any food, perfume, or toothpaste into your tent, and lock all food (or anything that smells like food) in your car at night. If you are hiking, either store your food in a designated area, or hang it in a tree away from your tent. Do not approach bears on the side of the road, and ensure that you never get between a mother and her cubs. Stay as calm as possible. You don't want the bear to misinterpret your fear as a threat. Talk to the bear in a loud, firm voice so it knows that you are human and not an animal. Back away slowly (do NOT turn your back on the bear). Don't run. Running could lead to a chase, and the bear will always win. Make yourself as big as possible. If you have kids with you, pick them up. Keep your backpack on your back, as it could act as protection if the bear attacks. If none of this has worked and the bear is advancing, it is now time to take steps to protect yourself. Grizzly bears are usually dark brown in colour and have a distinctive hump on their shoulders. They have long, sharp claws and average about 6'5" in height. They are the most dangerous, and most rare to encounter. 1. Use Pepper Spray on the bear (see Parks Canada's instructions on how to use it here). This will often be enough to stop any attack and allow you time to get away. 3. Play dead. A grizzly will stop attacking if it thinks you are dead and no longer a threat. It might toss you around a little bit or swat at you a few times, but should then walk away. Stay down for a few minutes once it is gone, as grizzlies are known to wait for a few minutes to make sure the threat really is dead. 4. If the bear continues to swat at you and attack defensively, it is time to fight back. Climb a tree, throw rocks, and do whatever you can to get away. The need to take this step is EXTREMELY RARE, and almost never happens. The bear should leave you alone well before it gets to this point. Black bears are smaller than grizzlies and, despite the name, may not always be black. They don't have a hump though, so it is pretty easy to tell the difference between the two. 2. Unlike with grizzlies, black bears are easily scared off. Make lots of noise, stand your ground and don't move away. 3. If the bear advances fight back by throwing rocks, sticks, or anything you can grab at it. Aim for the nose and eyes. They will most likely give up. 4. Don't run and don't climb trees, as these bears will follow you.